Since 4 weeks my training is going solid and steady. The wedding spell is almost over and the centre of attention shifts away from step-aerobic on various dance floors around Italy, Germany and Ireland towards asphalt and grass. Full tilt on the training front – at last! And as always there has to be a clear objective when getting into full preparation mode. Sad enough I cannot motivate myself with no goal in the diary. 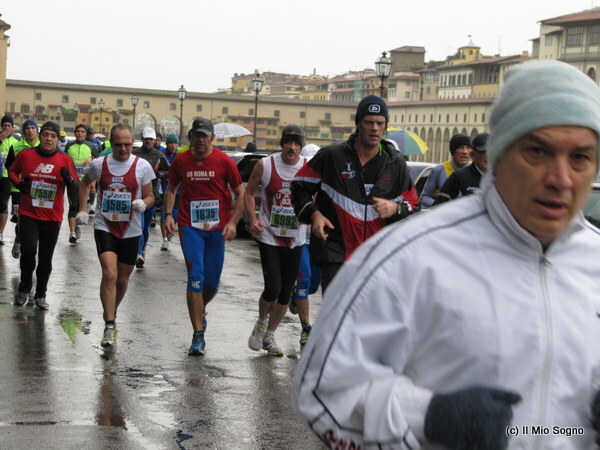 This time the final destination is the Florence Marathon on the 27th of November. As I ignored a good bit of the racing mid-season, Firenze is the last big race in the European marathon calendar and since a couple of years it is in my “race mind”. Each year runners from the UK and Ireland come home with great results and the standard in Italian road races is great when it comes to my range. After changing the “percorso” the route is now a fully certified IAAF race which no net-drop. When you look at the times in recent years it is obvious that the course is quick. A crucial point may be the cobble stone sections at the end. The weather in the last couple of years was always poor. Means – no sun, which is vital for me as I had to find out after sinking at the Rotterdam Marathon earlier this year. So I hope for the common shocking conditions with low temperatures and light showers on race day along the river Arno. Some friends also decided to race in Tuscany’s capital which makes the trip even more attractive. Around 14 weeks are left until race day and the “preparazione” regime will commence towards Florence. RUNSSEL MOVIE TUESDAY: Danny is at it again!